NSF/ANSI Standard 61 was developed to establish minimum requirements for the chemical contaminants and impurities that are indirectly imparted to drinking water from products, components, and materials used in drinking water systems. Standard 61 is intended to cover specific materials or products that come into contact with drinking water, drinking water treatment chemicals, or both. The focus of Standard 61 is evaluation of contaminants or impurities imparted indirectly to drinking water. In the U.S., 47 of 50 states have legislation that requires compliance with NSF/ANSI Standard 61. Products that are NSF Certified against NSF/ANSI Standard 61 demonstrate compliance with both Canadian and U.S. Plumbing Codes. NSF Certification and Testing is widely accepted. NSF data is recognized by ASSE, BOCA, IAPMO, ICBO-ES, SBCCI, City of Los Angeles and many others. Water is arguably the most valuable resource in the world. Today’s water treatment, distribution, and storage projects are under ever-increasing layers of regulations and requirements, one of the foremost being that components and materials that contact potable water not have potential adverse human effects. 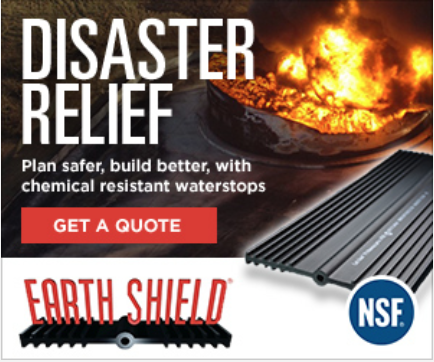 Earth Shield® TPV Waterstop, with NSF 61 certification, is the perfect choice for today’s critical water projects, and in particular drinking water projects.